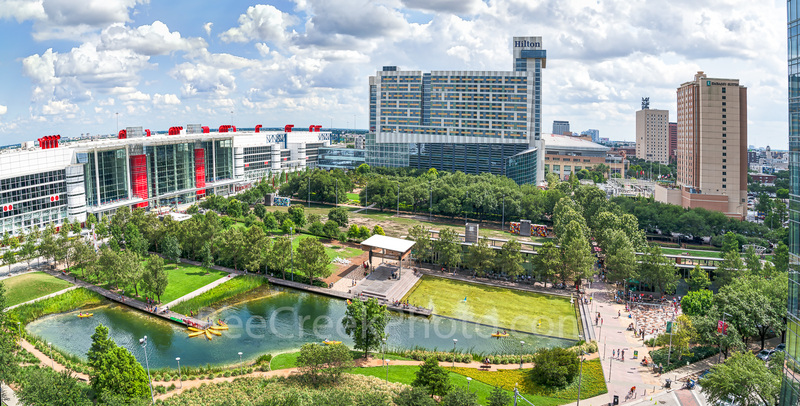 Houston Discovery Green Park Pano2 - This is the Houston Discovery Green Park pano from this aerial vantage point which let us create this great pano overview of this area. We loved that from this vantage point you could also see the George Brown Convention Center the high rise hotels and condos in the area along with the Kinder Lake and the childrens spray area for cooling down along with other area of the park. Along with the new convention Avenida Plaza and the Wing Over Water this area has a lot to see and do along with lot of good places to eat. Photo © copyright by Bee Creek Photography - Tod Grubbs / Cynthia Hestand.